The continuing heat wave in the United States in July 2011 has broken temperature records in many locations, killed dozens and seen nearly half of all Americans under heat advisories at its peak. These four movies, created from data from NASA's Atmospheric Infrared Sounder (AIRS) instrument on NASA's Aqua spacecraft for the period from July 16-24, show the movement of a dome of heat across the eastern two-thirds of the country. They highlight two familiar temperatures: surface air temperature and surface skin temperature, during both daytime and nighttime conditions. 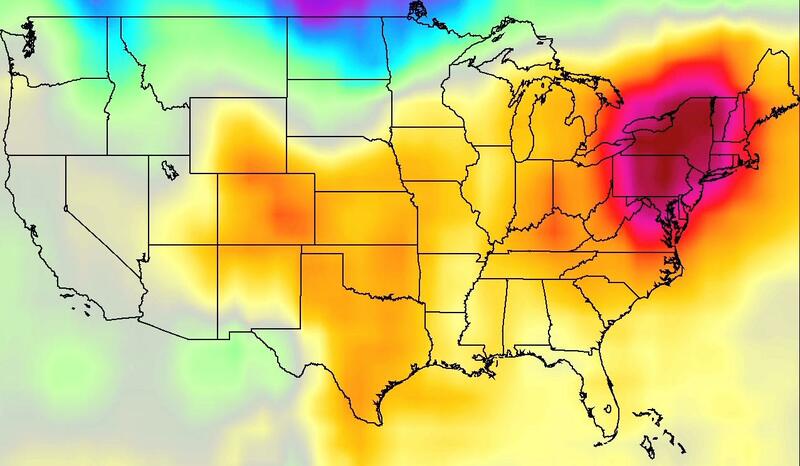 Surface air temperature is something we experience whenever we go outside. High surface air temperature makes even shady places feel hot. Surface skin temperature is what we feel when we touch the ground. During daytime, the surface skin temperature is generally much warmer than surface air temperature because dark surfaces are so effective at absorbing sunlight. The surface air and skin temperatures are related by something invisible but actually quite familiar: infrared -- or heat -- radiation. Our skin is very sensitive to infrared radiation, making a sun-heated wall feel warm even from a few feet away after sunset. Air absorbs very little sunlight, but easily absorbs infrared radiation emitted by the warm surface. It's the sun-warmed surface -- not sunlight -- that heats the air during daytime. 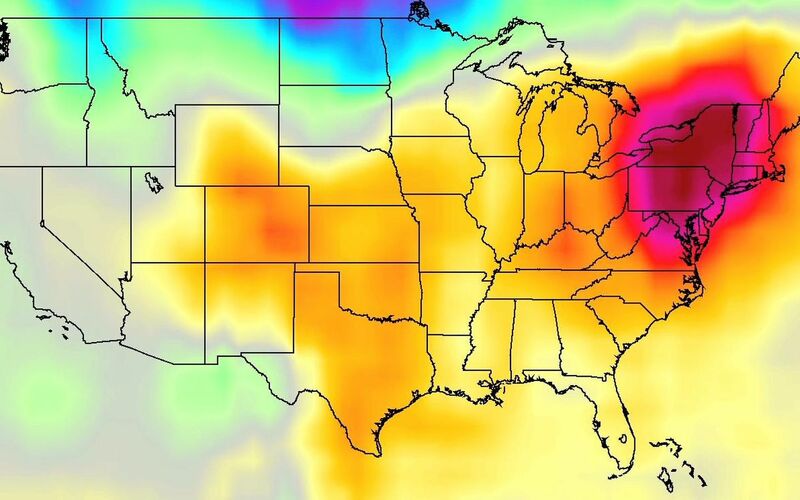 The four movies illustrate the extraordinarily high temperatures in the US heat wave. Both types of temperature, for daytime and nighttime, are shown as a difference (anomaly) from the average over the previous eight years of AIRS data. 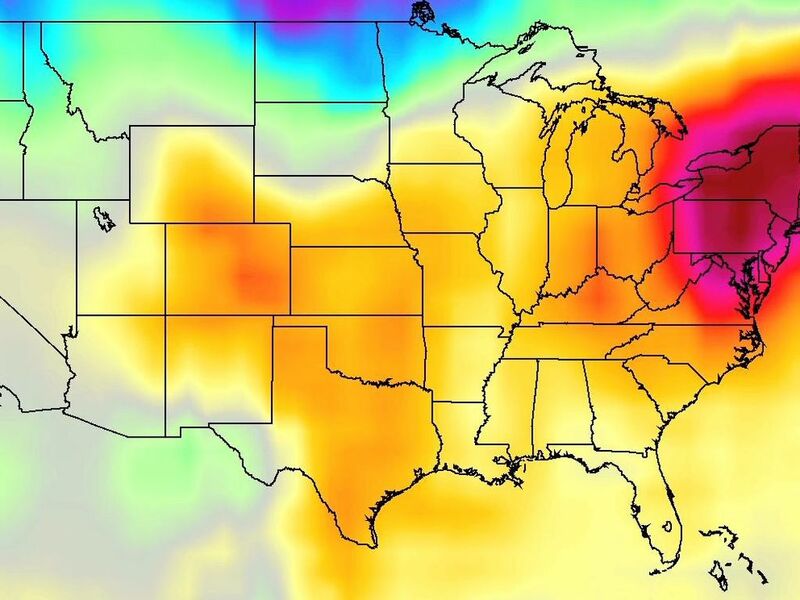 Over the Northeast and northern Midwest, temperatures are 20 degrees Fahrenheit warmer than normal. During normal weather there, daytime surface air temperatures are around 85 degrees Fahrenheit, while nights cool to around 70 degrees Fahrenheit. Temperatures 20 degrees above average show daytime highs over 100 degrees Fahrenheit and nighttime lows in the mid-80s. 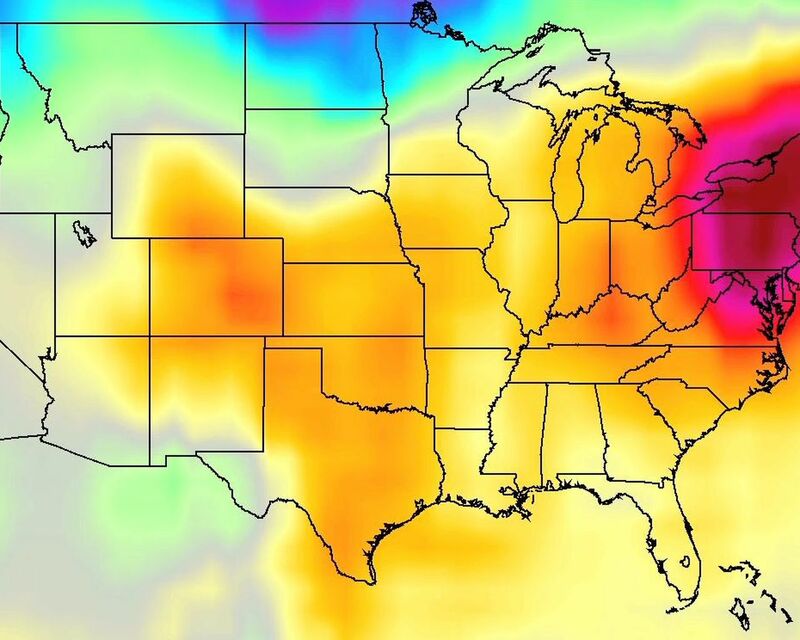 These high temperatures, along with high humidity (also observed by AIRS but not shown here), make the central and eastern US one of the hottest regions on the planet in late July 2011.